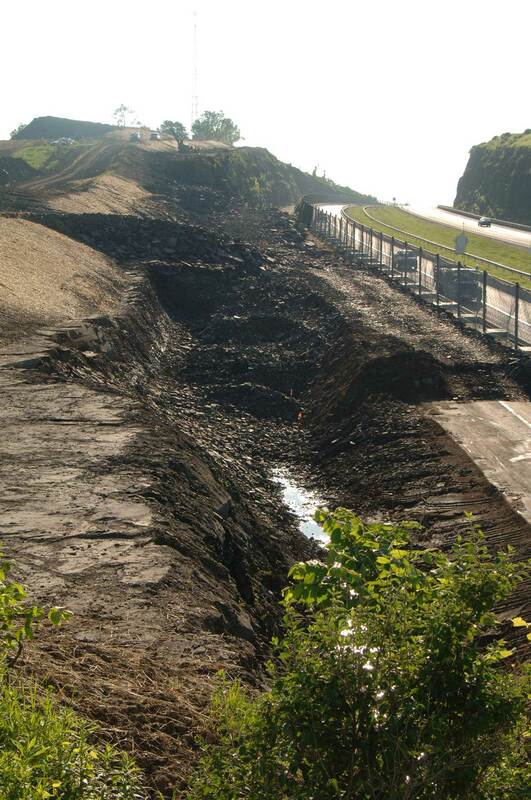 The throughway wanted the rock slope stabilized back to the foundation for the radio tower, without impeding traffic. To fragment the rock so that it could be dug without breaking it to a degree that it would slump into the roadway. We delivered a stable face through careful pre-splitting, excellent drilling parameters and minimal fragmentation. The MD&B team finished 30% (20 days) ahead of schedule. 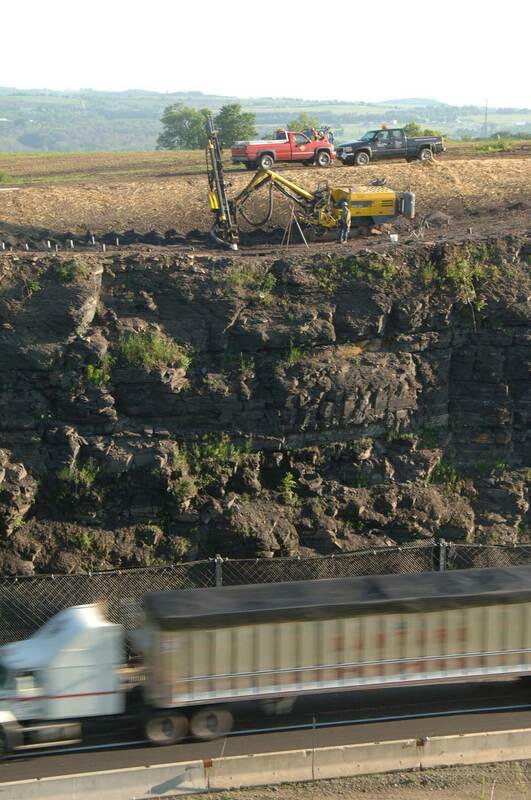 The throughway geotechnical experts knew what was important, and were pleased that we could provide that end product. 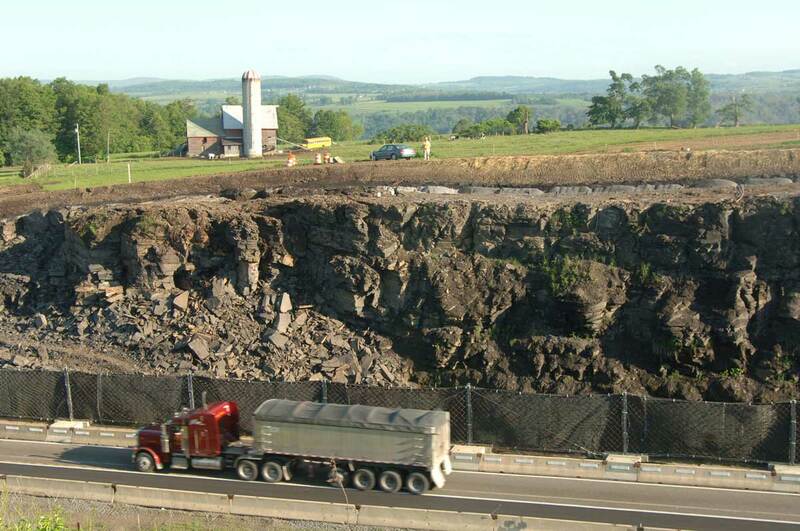 This I87 Rock Remediation project is a little different from the many I've done with Maine Drilling & Blasting, due to the fact its location is in the median between the Northbound and Southbound travel lanes and how close the rock is to the lanes. Besides the location, the formation of the rock is in many different directions and various stages of deterioration with soil seaming and large slip areas that are practically vertical. When the project was awarded, I knew that Maine Drilling & Blasting was a good contractor, and had very competent staff. I have worked with and have known them for years, and could always count on their knowledge, safety and professionalism to get the project completed. For this project, with all of its challenges, we would all have to step up our game, and step it up they did. They began the project by dissecting each proposed controlled blast and talking it through so we were all on the same page with every shot. They began blasting with planned conservative shots, and with every shot it was evident that they were understanding how the rock was reacting and how it needed to be shot to keep debris off the highway. The Thruway Authority was amazed with the high level of safety, production and professionalism. I know the Thruway Authority has plans to do more rock projects. Rifenburg Construction will be bidding on them and will have Maine Drilling & Blasting provide us with the high quality workmanship we desire."